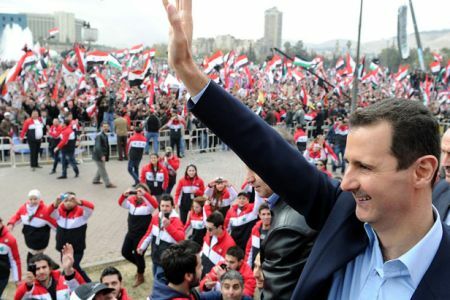 JNN 12 June 2014 Damascus : Syrian President Bashar al-Assad has announced a “general amnesty” for all crimes committed to date, state television said. President Assad has granted a number of general amnesties since the eruption of the crisis four years ago. The fresh pardon comes just days after Assad won the general presidential election by a landslide. The amnesty commutes sentences with more lenient ones, including commuting the death sentence to life penal labor, life penal labor to 20 years of penal labor, and life in prison to 20 years in prison. The amnesty also commutes the entire duration of the sentence for convicts with incurable terminal illness, convicts who are 70 or above, and for convicts of several crimes and misdemeanors, including abduction if the abductor frees the victim safely without taking ransom or delivers the victim to the authorities within a month of issuing this decree. The decree also grants amnesty for foreigners who entered Syria with the purpose of joining a terrorist group or committing a terrorist act if they turn themselves in to the authorities within a month of issuing this decree. Deserters are also granted full amnesty, both those who are inside Syria and abroad and who are not fugitives from justice. Fugitives wanted for other crimes can also benefit from the amnesty if they turn themselves in within three months. Earlier this week, media outlets said that at least 400 inmates were released from prisons ahead of the pardon’s issuance. Syrian authorities previously issued amnesties on May 31 and June 21, 2011. Two other amnesties were announced, on January 15 and April 16, 2013. Infighting between Syria’s militant groups has intensified in the past couple of days, leaving more than 120 dead, Al-Alam reports. Militants from the so-called Islamic State of Iraq and Levant (ISIL) and al-Qaeda’s al-Nusra Front, near Deir ez-Zor in eastern Syria, were engaged in heavy fighting after the ISIL managed to capture at least seven villages in the region. According to Al-Alam reporter, ISIL gains came after a militant group called ‘Council of Mujahedin’ retreated from the region in an unexpected move and left it to the ISIL. More than 120 militants were killed in the fighting and the number is increasing as the conflict is still going on, according to the report. Al-Nusra, which is fighting for al-Qaeda in Syria, has reported losing one of its top commanders, Abu Faisal al-Sharei, in fighting with ISIL. Hassan al-Hassan, a Syrian political analyst, told Al-Alam that the main reason behind deadly infighting between is that they have been spying on each other for a long time, and they have lost their trust. ISIL entered Syria’s war to fight for al-Qaeda, but it was later replaced with al-Nusra Front by al-Qaeda’s leader Aymen Zawahiri. ISIL and al-Nusra share same radical beliefs and are both known for their brutal crimes against Syrian people and soldiers throughout their extremist war on Syria. Syria sank into war in March 2011, when pro-reform protests turned into a massive insurgency following the intervention of Western and regional states. According to reports more than 150,000 people have been killed and millions displaced in the turmoil. This entry was posted in Middle East and tagged crimes and misdemeanors, General Amnesty, penal labor, president assad, Syria, syrian authorities, Syrian President Bashar Al Asaad, Syrian President Bashar al-Assad, Terrorist. Bookmark the permalink.